When director Kent MacKenzie released his 1962 documentary The Exiles about Native Americans living in the run-down Bunker Hill neighborhood of urban Los Angeles, it sank from sight. It was shown once at a festival to some acclaim but never got any general distribution and was soon forgotten. I think the film was too real for its own good. Fifty years later The Exiles has been reissued as part of an amazing two-disc set that will leave you wondering how it could ever have been ignored for so long. Mackenzie certainly did his homework on The Exiles. In 1956 he shot a student film about Bunker Hill and it was then that he got to know the people we see in the film. He spent years hanging out in Bunker Hill, on the street and in the bars and the film itself was shot from 1958 to 1960. One of the great things about The Exiles is that its POV is from the inside of the lives of the displaced Indians and not from the outside like some anthropological study. While they are uniquely Native American, they are also just ordinary people. 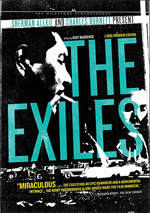 Fifty years later The Exiles has been reissued; how could it have been ignored so long? The Exiles begins with a montage of Edward Curtis photographs. Curtis’ turn-of-the-last-century portraits may have done as much as anything to define the popular image of Native Americans. MacKenzie shrewdly juxtaposes the standard notion of what an Indian was supposed to be with the reality what many Native Americans were like, which was just people like everyone else. Here are some of the players in The Exiles: Yvonne is unmarried, pregnant and dreams of someday having a home of her own. Her boyfriend drops her off at the movies so he and his buddies can go drinking and chase skirts. Homer goes along for the ride but without any real enthusiasm. He’ll have a couple beers and maybe see if he can start a fight. Rico gets him to sit in on a poker game but he’s bored. Homer gets a letter from back home in Arizona and in a brief interlude, we see Homer’s former life on the Rez. It is a dead-end place where nothing happens. Back at the bar, Tommy the slick ladies man is hitting on all the women and treating them like dirt. The way the men behave around the women in The Exiles is bad even by 1960 standards. Eventually the bars close, the cops haul off the drunks and everybody meets on top of “Hill X” (near the future site of Dodger Stadium) for a drum-beating tribal dance party until dawn. And for a moment it is as if they all belong to something again. Meanwhile Yvonne has stayed at the movies until they close, then she has wandered around looking in the windows of closed shops at stuff she’ll never buy before going to stay with a friend at her apartment. As dawn breaks, Yvonne wakes and looks out the window to see the drunken party has returned from Hill X and are staggering down the alley. She knows they will go home to sleep it off and do it all again the next night. I wonder if MacKenzie really knew that Curtis’s pictures were as much a fiction when they were taken as they were when The Exiles was made. Was he saying, “Here is what you think Indians are but that’s not true.”? Or was he saying, “That is the way they were but now they have fallen from grace”? Either way, Mackenzie was quick to say that this is not a generalization of all Native Americans but a look at a specific group that had literally wandered off the Rez and into downtown Los Angles. They have gone from one exile to another. These people may sleep with a roof over their heads, but they are truly homeless. Like Curtis’ work, The Exiles is visually stunning. It is black and white film noir style. The urban night shots of downtown LA are wonderful though perhaps more in tune with the late 40’s. Maybe that is another reason The Exiles didn’t catch on. It should have fit right in with the 1950’s zeitgeist of the Beats and yet didn’t. The raucous sax and trashy hoodlum rock and roll that opens The Exiles belongs in Rebel Without A Cause or Blackboard Jungle not an intellectual art house film. Which is not to say that the music was inappropriate. It’s probably right on the mark and just what the Bunker Hill locals would have been listening to. The problem is that in 1961, it wasn’t cool. But then the idea of Indian barflies wasn’t cool ... not like those noble Curtis photographs at all. And look at the way they behave and are dressed — rayon bowling shirts and chinos? Reading comic books? Hanging out in bars and getting in fights? In 1961 that was something just stupid poor people did. Where is the poetic romance? The bohemian beatnik fun? It’s one thing to watch poor Italians goofing in a Fellini film, but quite another to see your own low-lifes carrying on. But all that is all safely in the past. It is curious too that the distance between Curtis and MacKenzie is about the same as The Exiles is from us. Modern audiences can watch The Exiles like it was a report from another planet. And what a report it is. Students of LA will be fascinated with the scenes of the now lost Bunker Hill district which was scraped shortly after the film was shot to make way for an urban renewal project. It is really a shame that Kent Mackenzie, who died in 1980, did not live to see his film get the attention that it deserves. Nor that he never got to see Frozen River (2008) which is also a very blue-collar take on life on and off the Rez. Seen as a pair, the two films show the Indians enduring while the white man’s world of the vanished Bunker Hill and arbitrary borders is as temporary as the snow. The Exiles is a very compact film. All the action takes place in one night, in one neighborhood and with a handful of characters. The people in this film are essentially playing themselves. They wrote their own dialog and it is their voices we hear but for technical reasons the actual words were dubbed in later. This might be the low point for The Exiles as it gives it the feel of a 1950’s drivers’ education film... but one shot by Weegee. If that is The Exiles ’ only flaw, I can live with it. Chief beatnik Jack Kerouac is supposed to have originated the title of Naked Lunch when he said “The title means exactly what the words say: naked lunch, a frozen moment when everyone sees what is on the end of every fork.” The Exiles lunch is certainly frozen on the end of its fork. Now that it’s been rediscovered, I hope a lot more people get to see it. The great extras take up a whole second disc. One wonderful addition is a set of PDFs called The Mackenzie Files that includes his master’s thesis describing the making of The Exiles. This has to be the most detailed first person documentation of a film I’ve ever seen. Also included are four other short films Mackenzie made and shorts on the history of Bunker Hill. Be sure to watch The Last Day of Angels Flight, home movies of the Angels Flight funicular railway that appears in The Exiles. There is even a 1910 silent film: White Fawn’s Devotion, said to be the “first Native American film”. The commentary track by Sherman Alexie and Sean Axmaker is a must. Listen to it and find out what a “49” is. The restoration of The Exiles is simply amazing. This is film preservation at its best. You can watch everything in this set twice. But be sure to investigate the Mackenzie Files too.